One of the best things about writing a blog is that it means you get into the habit of really appreciating some little moments of magic. I might still notice them if I weren't blogging, but I wouldn't have photographed them and I'm pretty sure I wouldn't remember them in years to come. Yesterday was one of my days off, and we spent it pottering around. 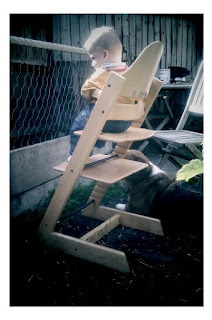 In the morning I took Alfie to a toddler group for the first time, which he loved. There were toys that went BING!, fire extinguishers that went CLANG! and other babies to engage in much mutual face gouging joy. Seriously, why do babies do that? Ooooh hello, you look nice, so to show you how much I like you I will smile at you and then I slowly reach out and rip your face off your skull. Needless to say after 2 hours of such heady excitement he slept soundly on the way home. He was in a pretty good mood when he woke up too, which meant we got the chance to have a lovely al fresco lunch and then Keith and I spent a few minutes solving the Chinese puzzle of Mercedes drive shaft removal. 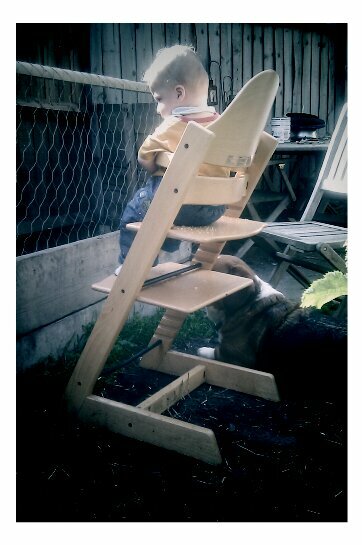 As soon as I had turned my back, Alfie was joined by his bestest bud Harry for a spot of chicken watching in the sun. When I went to go back up the garden this is what I saw. Excuse the terrible photo, I have to admit it was a bit of an afterthought to standing with Keith soaking up the cute.